Who is The Tax Doctor? Planning for your financial future is an important task every person needs to do. Earning a decent income today does not guarantee long term financial stability, especially if you do not have a plan to manage your finances long-term. Leaving your financial future in the hands of chance is a cause for stress, confusion, and uncertainty that can be avoided with a simple plan of action. 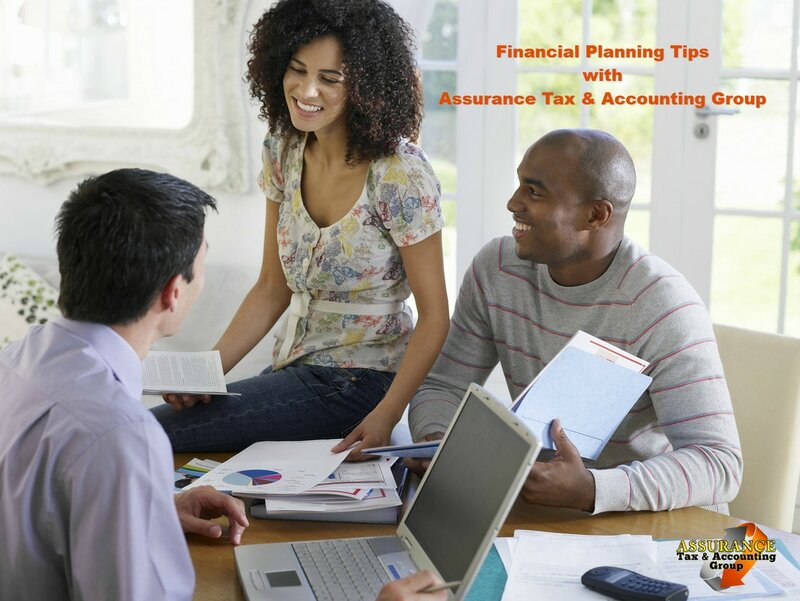 Below we cover several financial planning tips you should pay attention to this year and beyond. Pay close attention to your income: One of your greatest financial assets is the ability for you to generate an income. Over your lifetime thousands if not millions of dollars will pass through your hands and bank account. Determining necessary expenses from desires and wants can help save you a substantial amount of money. These savings can be used for investments or other avenues to grow your income and retirement account. So, make sure you are monitoring what you are earning and what you are spending on a daily basis. Preserve some of your money: Maintaining liquidity is vital to having a stress-free life. You should have three to six months of income saved for emergency situations that often happen at the worst possible times. Emergencies come in all shapes and sizes and often financial strain can be relieved if people have enough savings on hand. Learn to manage debt: Having a plan for getting out of debt is important to keep you ahead for the curve. If you do not have a debt management plan you will most likely just incur more debt and get deeper into the hole. The credit card companies goal is to keep you in debt for as long as possible, so you need to develop a plan for becoming debt free and staying that way. Have a long-term investment plan: Investing should be a long-term marathon not a short-term sprint. When you develop an investment plan of action try not to watch the stock market and panic every time it takes a dive. Downturns in the economy will happen and the markets will fluctuate, so planning long-term is advisable. Inevitably the markets will rebound and your investments will appreciate over the life of the investment. Diversify investments: As the saying goes, never put all your eggs in one basket. This is especially true of your investment portfolio. Diversifying your investments allows downturns in the market and economy to take place while keeping you safe from total financial catastrophe. There is always a cycle with investments and some inevitably take a downturn, but if your goal is long-term performance many of these investments usually rebound. So, having a diversified portfolio allows you to minimize your long-term risk. Attempt to maximize retirement savings: Maximizing your jobs retirement account is one of the best ways to plan for retirement. This is an effortless way to put your retirement savings on autopilot and grow your account. Check with your human resource personnel to make sure you are getting the maximum benefits from your account by seeing if there are better options for your age and your long-term retirement goals. Don’t forget about your kids: It is never too early to start a savings account for your kids. Whether you are starting a college savings account (typically 529 plans), a wedding expenses savings account, or just starting your kids out on the right foot, it is always a good idea to plan ahead. Expenses for children are increasing every year, from child care to sports leagues, you will have cost associated with raising kids and planning ahead is key to putting you kids in a good position for financial success. Check your insurance coverages: Just because you purchased insurance years ago, doesn’t mean that you are getting the best rates and benefits today. On a regular basis you should take a look at your coverages to ensure you are getting maximum benefits and savings. You may also find that you need additional coverage depending on your situation. In addition, don’t delay in buying life insurance since the younger and healthier you are the better rates you will receive that can be locked in long-term. Discuss money with loved ones: One of the main reasons marriage end is because of money. Do your best to avoid this by opening up about any money issues that may cause issues in your marriage. Far too often a husband or wife will hide secrets from their partner that is dealing with finances. This can have a negative effect on a marriage if it is not resolved and kept a secret. Remember children learn their money habits from their parents, so do your best to be good financial stewards of your money and talk about developing a sound financial plan for ongoing success. Ask for help: A lot of people that are in financial binds are afraid to ask for help. That is the worst thing you can do. If you are in need of assistance do not wait until this problem becomes unfeasible to address. Get the financial assistance you need to get out of that bind, and more importantly help you develop a plan of action going forward to keep you out of financial trouble. The best time to reach out to a financial specialist is before a problem arises so when and if they come you already have a plan in place to handle the situation. Financial planning is more than just getting your finances straight, a good financial planner will help you map out your life and get you on a path of financial freedom. Don’t wait until you are in need of help before reaching out to a financial planner. Assurance Tax & Accounting Group is partnered with one of the top financial planning firms in the state. So, fill out the form on this page to schedule an appointment for your complimentary financial consultation, or give us a call at 225-757-5518 and let one of our professionals get you the financial help you deserve. ASSURANCE TAX & ACCOUNTING GROUP. ​Assurance Tax and Accounting Group is an award winning full-service tax and accounting firm. We were founded on three guiding principles; clients, company, and community. Our personalized approach sets us apart from the competition. We offer a wide variety of tax preparation and financial planning services to individuals, small businesses, and owner-operated businesses. Fill out the form below for a free consultation, or to request information.